List of Top 10 Christmas Movies Ever for Kids, Families and Lovers. What do you prepare for celebrating the closing Christmas? Exquisitely decorated Christmas tree, joyful family party and wonderful dinner? All of them are essential. Besides, why don't you enjoy sweet and warm Christmas movies with your family after dinner? Now, let's check the best 10 Christmas movies of all time. • Rip Christmas DVD movies to MP4, H.264, AVI, WMV, MOV, FLV, 3GP etc, for better playback or further editing on PC/Mac. 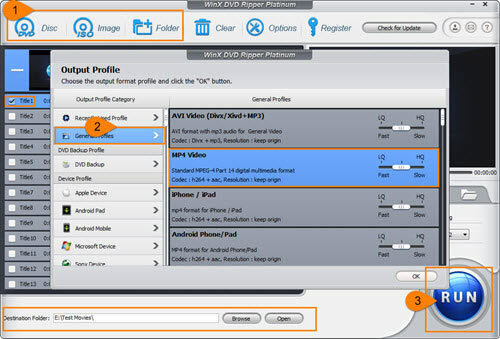 • Convert Christmas DVD movies to iPhone, iPad, iPod, Android, Windows Mobile, Xbox, Sony Playstation etc, with crisp output video for playback whenver wherever. • Copy Christmas DVD to ISO Image, VIDEO_TS folder, or a single MPEG2 from main/full title at 1:1 ratio without losing quality. Christmas themed movies vary in genres from fantasy, animation films for kids to comedy, romance films for whole family. Despite of genres, the best Christmas movies always remind us of happiest time of one year and tell what's important underlying the holiday, family, friends and lovers. What Christmas Story It Tells: Kris Kringle is hired as Macy's Department Store Santa to lead Thanksgiving Day parade replacing the drunken Santa actor. 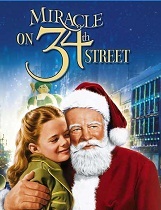 In order to prove that he is a real Santa Claus, Kris goes to court and finally get Doris the Macy's executive and her daughter Susan believe in him. What Christmas Story It Tells: The guardian angel Clarence visits earth on Christmas Eve to help George Bailey who gets involved in suicide for considering himself as a failure after receiving prayers to from George's friends and family. Clarence shows the terrible future of the town without George and makes him realize that the life is wonderful. What Christmas Story It Tells: Love Actually is the only Romance film of best Christmas movies. It is themed "Love is All Around" and tells loosely interrelated ten stories about love happened one month before Christmas in England. Someone is looking for the right person. Someone meets the wrong one. Someone is falling in love, while some others break up. What Christmas Story It Tells: Jack Skellington, Pumpkin King of Halloweentown, gets tired of monotonous life, wondering deliver more joys to his town. Stumbling upon Christmastown, he decides to share idea of Christmas with Halloweentown citizens. Production Co.: New Line Cinema | Guy Walks into a Bar Productions | Gold/Miller Productions | Mosaic Media Group | Shawn Danielle Productions Ltd.
What Christmas Story It Tells: Buddy was brought to North Pole with Santa's sack of gifts and grew up as an elf. Buddy determines to go to New York City in search of his birth parents when he is aware of his human identity. What Christmas Story It Tells: McCallister family plans a Christmas vacation to Paris and accidently leaves 8 year old Kevin alone in home. Instead of feeling unhappy, Kevin enjoys the hard-won freedom until two burglars Harry and Marv plans to rob his house on Christmas Eve. Indeed, it is one of the best Christmas movies appropriate for sharing with your kids. What Christmas Story It Tells: On Christmas Eve, miser Ebenezer Scrooge is visited by three ghosts of his dead business partner Jacob Marley, who show Scrooge his youth, current situation and fates awaiting him. Suddenly awakening on Christmas Day, Scrooge takes on a journey of self-redemption. Production Companies: Castle Rock Entertainment | Shangri-La Entertainment | Playtone | ImageMovers | Golden Mean | Universal CGI | Warner Bros.
What Christmas Story It Tells: Besides A Nightmare Before Christmas and A Christmas Carol, The Polar Express is the third animation film in best Christmas movies list, presenting a hero boy's adventurous journey to the North Pole and Santa Claus's home by the powerful magical train called the Polar Express. What Christmas Story It Tells: 9-year-old Ralphie Parker is refuted with his mother, teacher and Santa of department store because he asks for a Read Ryder Range Shot 200 BB gun as his Christmas present. Eventually, he receives this dream gift from his father when the big day is arriving. It is believed that this best Christmas movie can recall Christmas days in everybody's childhood. There are multiple reasons to rip and backup best Christmas DVD movies for kids, protecting from being broken/scratched, playing them on portable devices during Christmas vacation and so on. WinX DVD Ripper Platinum, a powerful DVD ripping tool, enables you to rip best Christmas DVD movies (including ripping copy-protected DVDs) to any popular formats (MP4, AVI, MOV, WMV and more), devices (iPhone, iPad, Samsung Galaxy, Windows Phone, Surface Pro etc.) at a very high speed and deliver possible highest quality due to built-in High Quality Engine. It also allows you to backup best Christmas DVD movies at 1:1 ratio in 4 modes, DVD to ISO, DVD to VIDEO_TS Folder, main/full title to a single MPEG 2 file. How to Backup Christmas DVD Movies? At the beginning, you need to download and install WinX DVD Ripper Platinum on your (Windows 10) PC. Mac user please switch to the Mac version. Step 1. Import DVD in DVD drive. Launch WinX DVD Ripper Platinum and hit DVD Disc button. Alternatively, you can import ISO image or DVD folder as movie source. Step 2. All titles of the Christmas DVD will be loaded. And, main title will be automatically selected. Meanwhile, Output Profiles pops up. There are many profile category supported, General Profiles, Backup Profile, Device Profile, Web Video Profile, Music Profile etc. Select the most appropriate profile according to your needs. It is recommended to select MP4 as output format because it is widely compatible with diverse players and devices. Step 3. Hit Browse button to set destination folder and click RUN button to start ripping your Christmas movie DVD. WinX DVD Ripper Platinum – Fast rip (latest) Christmas DVD movies to MP4, H.264, AVI, WMV, MOV, iPhone, iPad, Android, Windows Phone, Surface Pro, PS3/4, Xbox etc, with crisp images and hi-fi audio for playback on PC/Mac/devices whenver wherever. It is also available to copy DVD to ISO/folder and backup main/full title to single MPEG2 file at 1:1 ratio helping you preserve Christmas movies in digital files for a long time.